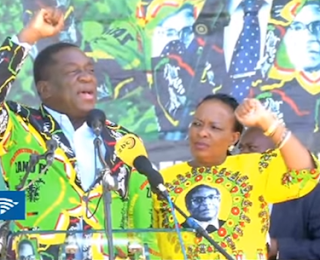 THE stand-off between President Robert Mugabe and Vice-President Emmerson Mnangagwa over alleged food poisoning, took a new twist on Saturday when the under-fire Vice-President and his wife, Auxilia, were denied ice-cream snacks sourced from the First Family’s Gushungo Dairy during a youth interface rally at White City Stadium in Bulawayo. NewsDay staff observed as the waiters serving the ice-cream in the VVIP tent skipped Mnangagwa and his wife after all other top government and Zanu PF officials, among them Mugabe and First Lady Grace, got their share of the ice-cream. Other top officials who partook of the ice-cream were State Security minister Kembo Mohadi, Joshua Malinga, Local Government minister and Zanu PF political commissar Saviour Kasukuwere, Home Affairs minister and party treasurer Obert Mpofu, Defence minister Sydney Sekeramayi, Finance minister and ruling party administration secretary Ignatius Chombo, Vice-President Phelekezela Mphoko and his wife, Laurinda. Next to Mphoko was Grace and the President followed by national youth secretary Kudzanayi Chipanga, Mnangagwa and his wife. At the end of the row were four youth league executives who also had their share of the ice-cream. Relations between Mnangagwa and Mugabe have dipped over the last few years amid allegations that the Vice-President was plotting to oust the 93-year-old Zanu PF leader. Their fallout only started playing out in the public glare in August this year after Mnangagwa fell sick during a Gwanda interface rally addressed by Mugabe, and was airlifted to South Africa for treatment with his allies claiming he had ingested poison-laced ice-cream from Gushungo Dairy. On his return from South Africa, both Mnangagwa and Mugabe made strenuous efforts to demystify the claims and distance the First Family from the poisoning saga, but the Vice-President’s allies dug in. Mnangagwa later unwittingly let the cat among the pigeons when he told party supporters at the late Masvingo Provincial minister Shuvai Mahofa’s memorial that he had indeed been poisoned, although he did not directly implicate the First Family for the alleged assassination attempt. As if to add to the drama, Mugabe and Grace on Saturday took turns to pummel Mnangagwa, ordering him to leave Zanu PF. Mugabe even threatened to fire him at the upcoming politburo meeting. Mugabe bemoaned failure by the ruling party to win seats in Bulawayo for the past 15 years since the formation of the MDC. He said they were in Bulawayo to hear what residents wanted so as to reclaim the city. “Bulawayo is the second city to Harare and we cannot afford to be losing it,” Mugabe said. “We shall not allow the opposition to take the lead this time. If it means spending 3 to 4 hours to organise let’s do so. Elders here wake up. Get up and regard this as an obligation to get Bulawayo on top and not allow (MDC-T leader Morgan) Tsvangirai and (his deputy Thokozani) Khupe to be ahead of us. Let Bulawayo regard this as a reawakening. This interface is a reawakening of Bulawayo, a new reawakening and we shall not again be seen lacking in support of our party Zanu PF.